Many people believe that poor productivity is linked to laziness, but that’s seldom the case. There are many influencing factors that go beyond simply “not feeling it” when your productivity has taken a hit. 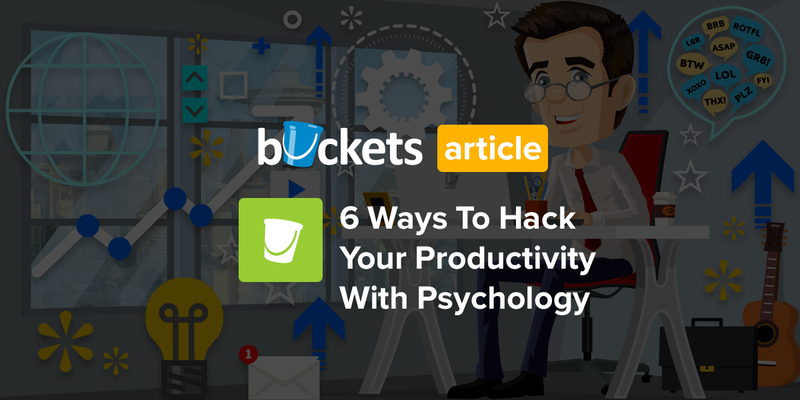 Understanding these factors, and the psychology behind productivity can help you to work optimally every day regardless of what’s happening a home or in the workplace. So if you’ve been feeling a bit unproductive lately, try out a few of these psychological hacks to give your brain a boost! The average person spends less than 5% of their working day in a state of flow. But what is flow? According to researcher and author Steven Kotler, “flow is an optimal state of consciousness, when you feel and perform your best”. Alarmingly, a recent Gallup poll found that 71% of Americans are inactive or disengaged in their work. So not only are we seriously lacking in the “flow” department, it’s also having a knock-on effect on our daily productivity. There are a few ways to get in the zone or “find your flow” but one of the best ways is to automate your workflow. Take a look at your task list and figure out what needs to be done right now, what needs to be done today, and what can be done later. To organize these tasks, set up 3 lists for “to-do”, “doing”, and “done”. Once you are focused on the tasks that you’ve cleared in your “doing” Column, your brain will stop trying to interrupt your flow with what it thinks you “should” be doing. “That constant awareness of what is next is what keeps you focused” — Mihaly Csikszentmihalyi, author of Flow: The Psychology of Optimal Experience”. Following this method ensures that you always know where you are in your workflow. Your brain needs to have a plan, so simply having something scheduled can make a big difference to your level of concentration. Psychologist Roy F. Baumeister has been studying the concept of willpower and ego depletion for years. In his most popular experiment, he asked a group of test subjects to choose between chocolate and radishes before completing a difficult puzzle. The subjects who chose the radishes (and used their willpower), quit the puzzle exercise faster than those who chose the chocolates. From this and similar experiments, Baumeister concluded that willpower is a finite resource that we can certainly run out of. Each person wakes up in the morning with a limited amount of willpower and this is depleted with every decision made and temptation resisted throughout the day. So if you’re wondering why you’re much more likely to pick up a bottle of wine on the way home than at lunchtime… there’s a hint (and also because you’re probably not an alcoholic). With this in mind, it’s important to reserve your willpower for decisions and tasks that actually matter, which brings us to the importance of the to-do list and your most important things (MIT’s). Always get your MIT’s done first. Your brain’s working memory is for short-term storage. So whilst it’s very useful throughout the day, it can only hold a limited amount of items at once. If you start cramming it with more information than it can handle, your productivity and performance will start to crumble. Creating a to-do list allows you to free up space in your brain for the tasks you’re working on right now. And if you step it up a level, using Buckets will allow you to create Projects to keep track of absolutely everything in your work and personal life, so that you can stay even more focused in the present moment and on the task at hand. We waste a lot of energy thinking about doing things rather than actually doing them. If there are urgent items on your to-do list that you’re worried about, you need to get them done ASAP or you’ll spend the day procrastinating instead. Of course, you should cover your most important tasks (MITs) first, but after that, it’s time to tackle whatever is most urgent on your list. You’ll feel more motivated and confident about completing the rest of your tasks once you have a few already completed. The motivation of being “almost done” will give you the push to focus on those tougher tasks. We’ve covered this endlessly, but yet still not enough. Your brain isn’t wired to multitask. Don’t do it. The end. Just kidding (about “the end” part). What you refer to as multitasking is actually your brain rapidly switching between tasks. Sounds exhausting, right? As you can imagine, this constant switching has a massive cognitive cost on your brain. In addition, the late Stanford researcher Clifford Nass studied the work patterns of multitaskers and found that “multitaskers are terrible at every aspect of multitasking. They’re terrible at ignoring irrelevant information; they’re terrible at keeping information in their head nicely and neatly organized; and they’re terrible at switching from one task to another.”. So rather than trying to work on 10 things at once, why not stick to your to-do list and only focus on what’s right in front of you. If you must attempt to “multitask”, only do so if you can group a max of 2 or 3 very similar tasks together. We usually look at procrastination as a time management problem, but it’s actually a lot more than that. The reasoning behind why people procrastinate is quite complex and more of an emotional issue than a self-control issue. Dr. Tim Pychyl, professor of Psychology at Carleton University in Ottawa, Canada has been studying procrastination for 19 years. In an interview with Vox he discussed the biggest misconceptions about procrastination, stating that “psychologists see procrastination as a misplaced coping mechanism, as an emotion-focused coping strategy. [People who procrastinate are] using avoidance to cope with emotions, and many of them are non-conscious emotions”. So if you’re putting off tasks or commitments, it’s probably due to fear rather than sheer laziness. If you want to stop procrastinating, you need to identify and address that fear first. I’m not saying that these psychological hacks will turn you into a multi-million dollar CEO overnight, but they will amp up your productivity. After all, it’s science. So give it a go and let me know how you get on! Content & Social Media Marketing Mgr at Buckets.co. Buckets is a collaborative project management platform designed to help you organize everything in both your personal and professional life.